Movie Review: What an irksome trip, spanned over many decades, is presented to us in “The Age of Adaline”, an epic fantasy romance directed by the young talent, Lee Toland Krieger, who did a much interesting job in the more realistic and charming “Celeste and Jesse Forever”. Mr. Krieger takes on a script, written by J. Mills Goodloe and Salvador Paskowitz, which is not so original as desired, and with the help of a narrator, tells us the long life of Adaline Bowman (Blake Lively), a woman born in 1908 who became ageless at the age of 29, after being mysteriously hit by a lightning bolt during a car accident. This unexplainable episode forces her to constantly change identities and move out to cover her secret. Her daughter, Fanning, becomes the only person who knows the truth, aging as her mother remains young and knowledgeable. The narrative restarts in a New Year’s Eve party, this time with no voiceover, where Adaline, now under the name of Jennifer Larson, falls in love with Ellis Jones (Michiel Huisman). Tired of running away, she struggles with herself from not being able to embrace this genuine love with all her heart. After a period of caution and hesitation, she decides to give Ellis a chance. However, she will be caught off guard when she meets Ellis’ father, William (Harrison Ford), her former lover at a young age. 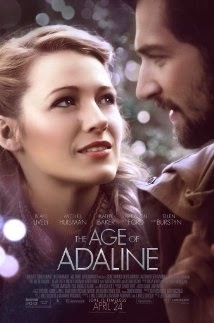 Playing with the timeline and fortuity, “The Age of Adaline” will bring up to mind other related films, cases of “Benjamin Button” and “Big”. I can assure you that it doesn’t do better than any of them, relying on a too schematic structure, a too invariable tone that tilts to sweetness, and a few too obtuse scenes that help dragging the film down. The result? It’s too short to deserve attention.